Ganguly, I., Abraham, S., Bharath, S., Madhavan, V. (2014). Development of Fast Dissolving Sublingual Wafers of Promethazine Hydrochloride. Iranian Journal of Pharmaceutical Sciences, 10(1), 71-92. Indranil Ganguly; Sindhu Abraham; Srinivasan Bharath; Varadharajan Madhavan. "Development of Fast Dissolving Sublingual Wafers of Promethazine Hydrochloride". 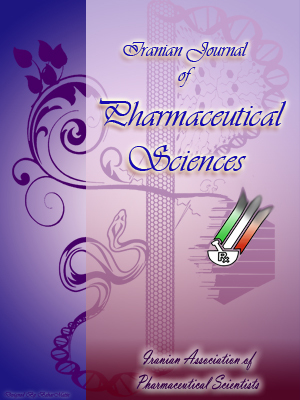 Iranian Journal of Pharmaceutical Sciences, 10, 1, 2014, 71-92. Ganguly, I., Abraham, S., Bharath, S., Madhavan, V. (2014). 'Development of Fast Dissolving Sublingual Wafers of Promethazine Hydrochloride', Iranian Journal of Pharmaceutical Sciences, 10(1), pp. 71-92. Ganguly, I., Abraham, S., Bharath, S., Madhavan, V. Development of Fast Dissolving Sublingual Wafers of Promethazine Hydrochloride. Iranian Journal of Pharmaceutical Sciences, 2014; 10(1): 71-92. Promethazine hydrochloride, a 5-HT3 antagonist is a powerful antiemetic drug with an oral bioavailability of 25% due to extensive hepatic first pass metabolism and is extremely bitter in taste. To overcome the above draw backs, the present study was carried out to formulate and evaluate fast dissolving taste masked wafers of Promethazine hydrochloride for sublingual administration. Taste masking was achieved by inclusion complexation with β-Cyclodextrin, confirmed by e-tongue evaluation. The wafers were prepared by lyophilization, using polymers such as Gelatin, Xanthan gum and Methyl cellulose in different ratios. The IR spectral studies showed no interaction between drug and β-Cyclodextrin or with other additives. Satisfactory results were obtained when the wafers were subjected to tests such as uniformity of weight, thickness, surface pH, uniformity of drug content, disintegration time, moisture uptake, moisture loss, moisture content, and in vitro drug release studies. Ex vivo drug permeation studies were carried out using porcine membrane model and a drug permeation of 33-99% was observed through porcine mucosa within 6 min. In vitro release studies indicated 98-100% release within 6 min. A higher percentage of drug release was observed from wafers containing a combination of Gelatin and Xanthan gum. The stability studies conducted for a period of 12 weeks showed no appreciable change in drug content, surface pH, and in vitro drug release and ex vivo permeation for the first 8 weeks. Thus stable, porous, uniformly loaded fast disintegrating, taste masked Promethazine HCL lyophilized sublingual wafers with good compatibility and stability were achieved.